Neighborhood advocates, national experts gather for San Marco by Design event - The Resident Community News Group, Inc. | The Resident Community News Group, Inc. Representatives from San Marco Preservation Society, the Health Planning Council of Northeast Florida and Healthy Kids, Jacksonville/Blue Cross Blue Shield gathered at Southside Baptist Church last month to release findings of the San Marco by Design project, a yearlong study that looked at design parameters and strategies for the San Marco community. 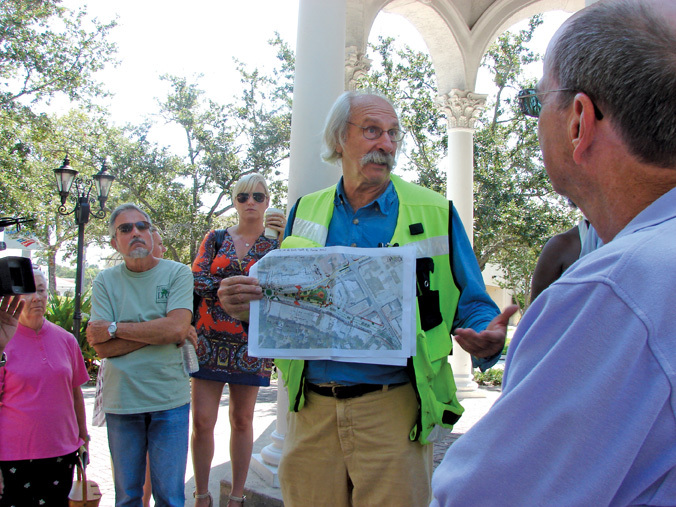 The group also welcomed Dan Burden, executive director of the Walkable and Livable Communities Institute, who spoke at the event and shared his observations of the neighborhood during a walkabout through San Marco Square. Students from Julia Landon College Preparatory and Leadership Development also presented their work on the Safe Routes to School project during the morning event. The San Marco by Design report is a culmination of more than a year of community focus groups studying North San Marco’s transportation ,infrastructure, parks, schools, commerce and walkability. The final report is defined as a “Smart Growth Plan for North San Marco.” In addition to SMPS, the health planning council and Blue Cross, the report was sponsored by support from the City of Jacksonville Planning and Development Department, Baptist Hospital Systems, Regions Bank, Mike Balanky, Keith Kimbell, Eddie Fink and Robert Harris. Former SMPS President and San Marco engineer, Doug Skiles, describes the project succinctly in the report. Feinberg said several initiatives have come out of the study. One of the first is Skiles’ effort to redesign traffic flow through San Marco Square as part of the final phase of the San Marco Streetscape project. In order to increase walkability and promote safer traffic flow, he proposed a plan to restructure traffic lights in the middle of the square and access to Atlantic Boulevard. Those plans are under consideration. Another focus will be parking, as well as park improvements and addressing regulatory issues with the city’s planning department over time. Feinberg also is helping to spearhead a better mid-block crosswalk for Landon College Preparatory and Leadership Development students using Atlantic Boulevard. San Marco by Design’s focus on neighborhood walkability and Safe Routes to School helped bring small, but important community needs like crosswalks and sidewalks, into focus.